It is anticipated that a report will be submitted to the meeting of the Werneth Area Committee on 8 June 2015. Stockport’s website suggests that the report will be available before the meeting, perhaps a week before the report is considered by the Committee. It seems that the intention is that interested parties, keen to see how any new proposals affect them, will be able to view the report on-line on June 1st. This gives a week to consider and raise questions with local decision makers. As in the previous meeting, questions can be submitted to the Werneth Area Committee Meeting about any new plans for a bridleway at Chadkirk. May. One of three months when our meetings end and there is still some light in the sky. May. June. July. Longer days and light evenings. Leaving Chadkirk Chapel and walking down the lane as night falls, this evening, light in the northwest and the gibbous moon, just off full, rising in the east. On the air, the spicy tang of wild garlic and the warm animal smell of cattle grazing on the pasture in the meadows. At this evening’s meeting of Friends of Chadkirk, it seemed that all of life was in the mix.The discussion ranged over activities from biodiversity and animal rescue, to footpaths, wood carving, tombstones and easter eggs – a flavour of the many ways in which this group gives time and energy to this special landscape. During the meeting we learned that Chadkirk Chapel had attracted over 400 visitors (making it the busiest heritage site in Stockport that day), many of those took part in the Easter Egg hunt organised by our resourceful volunteers. The money raised by this and the sale of Mary’s Easter chicks is a valuable contribution to the fund that is used to maintain Chadkirk Chapel and gardens. Gorton Animal Sanctuary is a popular attraction at the Chadkirk Festival and our Easter service retiring collection made a contribution to this charity. The certificate we received in return ( a thank you for the donation) this is now proudly displayed on our notice board in the Chapel. Two of the volunteers are working on a project to update a 30 year old booklet which provides an historical record of the tombstones and gravestones in the Chapel and the Chapel grounds. This is a work in progress as we look to explore ways of making this information available to people who are interested in the lives of local people over the centuries. As we look forward to the summer months, plans are crystallising for the Festival. Stall holders have received letters requesting confirmation, and at a future meeting we’ll have a list of the full range of attractions on offer. Before that there’ll be the Plant Sale on June 13th. It was emphasised that this starts at 2-30pm. Under Any Other Business there was a request for information about the woodcarvings at Chadkirk. There’s a wooden carved St. Chad outside the Walled Garden. Who is the artist/craftsman who made this? Is it the same person who carved the giant woodpecker on the tree overlooking the garden? And who, we wondered , made the giant wigwam on the hillside , by the path through Kirk Wood? A local writer is interested to know the answer to the first question. 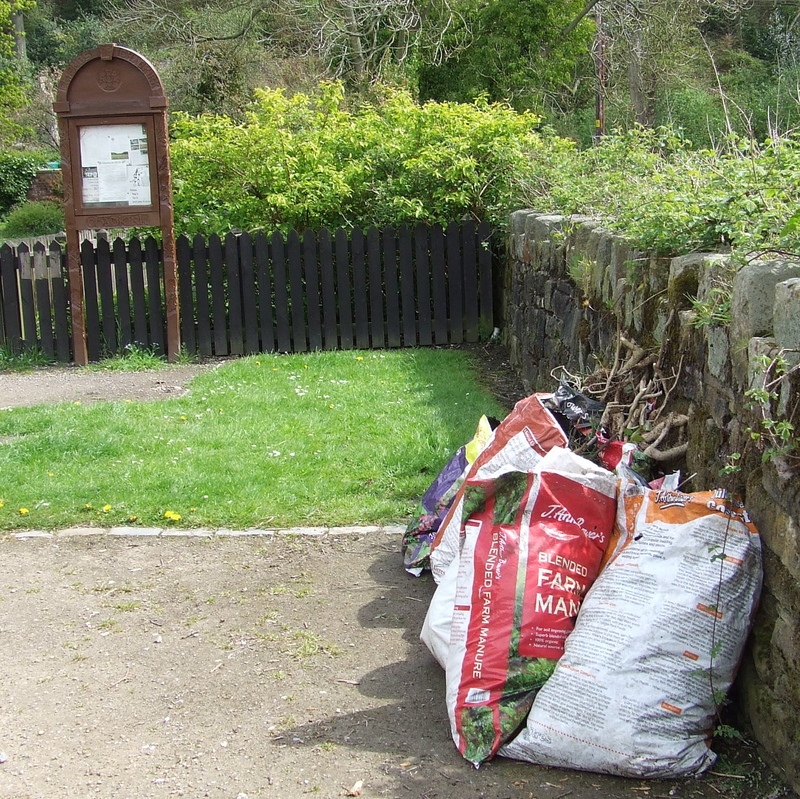 We’d also like to know the identity of the others who have made their own contribution to the particular quality of Chadkirk Country Park. There are so many delights at Chadkirk that it seems impossible to pick a favourite. However, for many people, it would be the footpath by the stream. A few steps from the car park, you are soon beside the stream and looking out over fields towards the woods. Although the path is not really suitable for wheelchairs, it is ideal for walkers who need to be on the flat and can just manage a short walk. Alternatively, runners like to use this path as part of their circuit. And for dog walkers it is an opportunity to let dogs run (and paddle!) without fear of traffic. 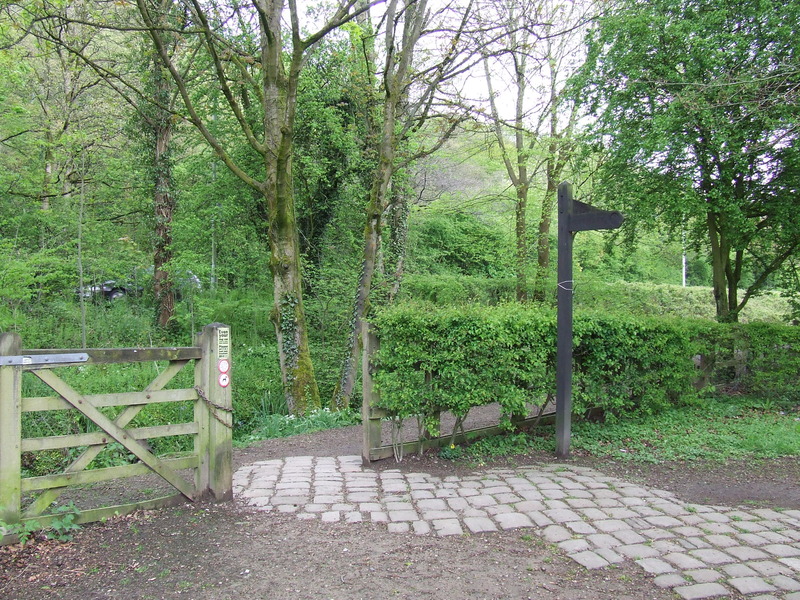 While many people use this path each day, it’s existence was overlooked in the plans to change Chadkirk by adding a bridleway.These plans proposed the closure of this much loved and well-used footpath. Although this proposal was initially agreed at Werneth Area Committee meeting, once the local representatives became aware of the planned closure of the footpath and several other significant issues, the plans were halted. The process of consulting local groups has been taking place. Soon the decision to rescind the plan will come before a Werneth Area Committee meeting. This consultation process means that for users of the path there is an opportunity to express your views. Individuals can also ask questions at the next committee meeting. The meeting is open. There are many people who visit Chadkirk regularly and who may be unaware of this planning process, so in part, I am writing this to provide information about that process. In addition, there may be a way to safeguard this footpath from any future threat. This involves the process of having the path dedicated or recorded. This process can take a while…However we have started the ball rolling and will keep you updated about that here. In the meantime, if you have walked this path regularly, repeatedly, frequently over the years then you might be able to be part of that process by providing a witness statement. Please get in touch through the comments section of this blog and/or come along to a Friends of Chadkirk meeting. 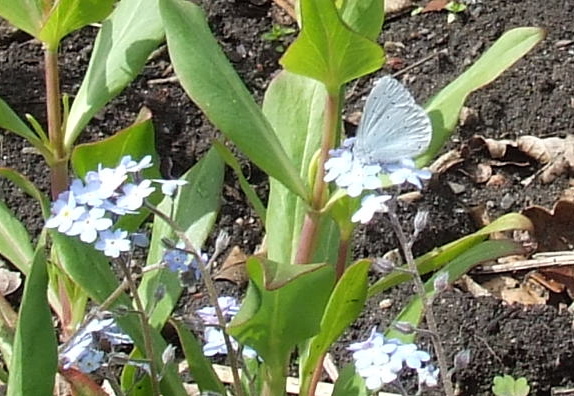 Early May 2015 has brought a mixed bag of weather. However for those fortunate enough to be able to visit Chadkirk on Bank Holiday Monday, there was plenty of pleasant sunshine and an opportunity to enjoy Chadkirk at a lovely time of the year. 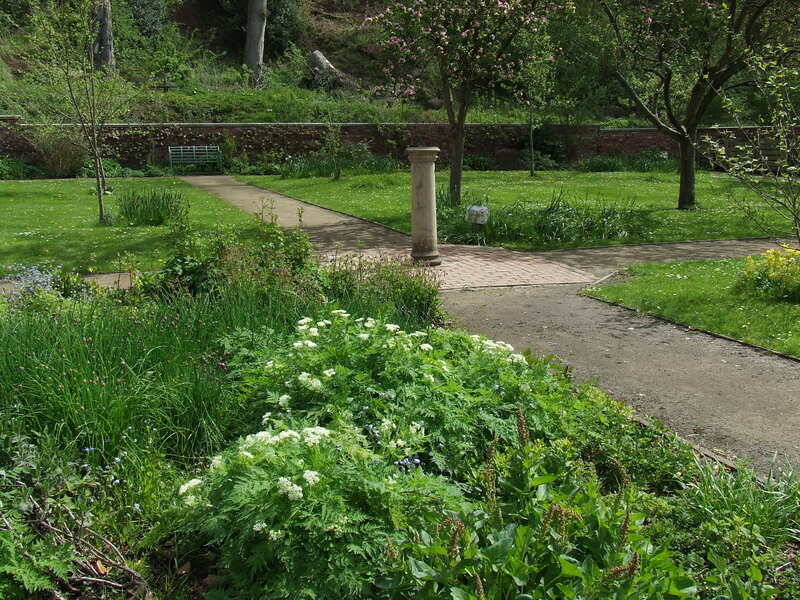 In the Walled Garden, a family from Macclesfield were delighted to find the Chapel and Walled Gardens, hidden away within a short distance of a busy main road. 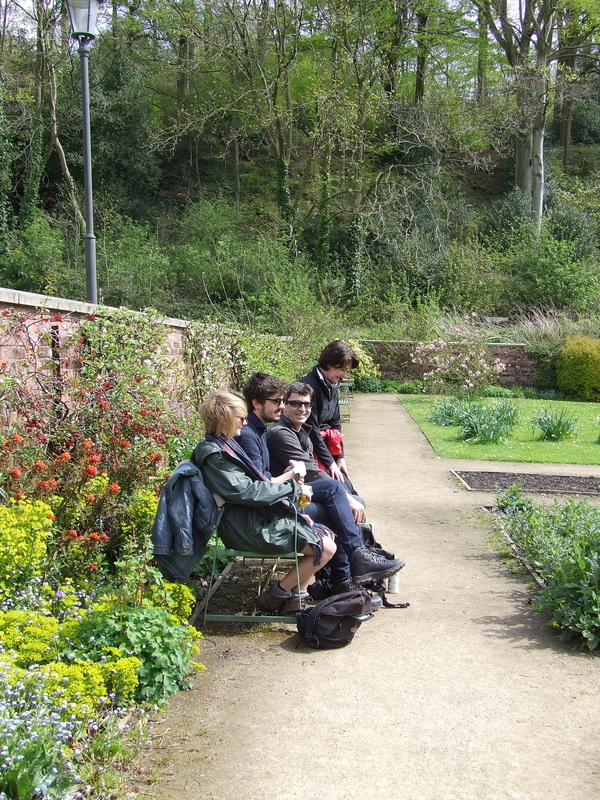 Seats in the sun, in a beautiful sheltered place of tranquility gave them an ideal spot to sit and stare. Time to sit and stare? 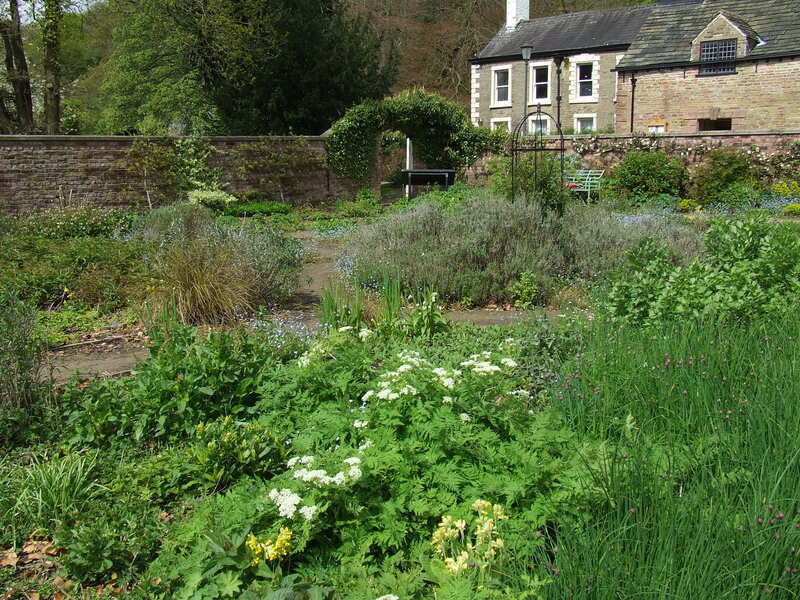 Like many of the visitors, they were surprised to learn that these beautiful gardens are largely maintained by volunteers.A small team of gardeners from the Friends of Chadkirk had been in the gardens on Saturday. For those in the know there were telltale signs of the work that they had done. 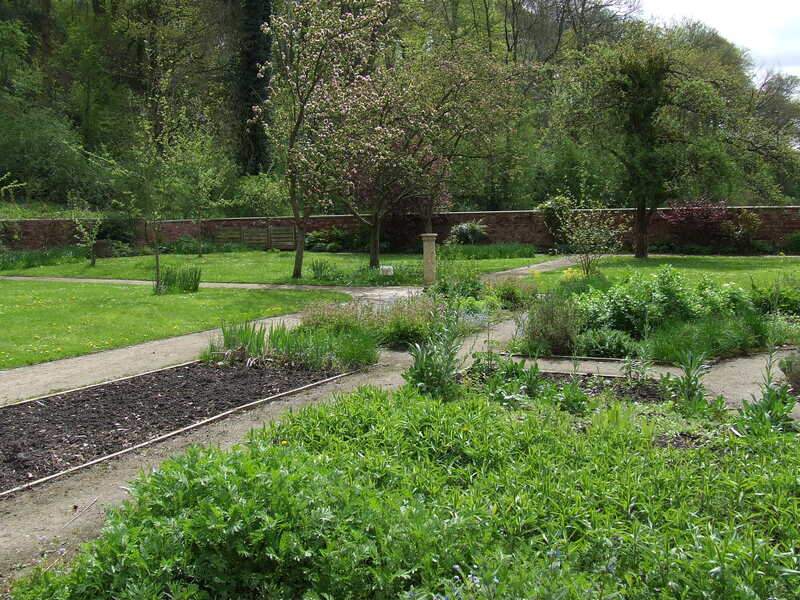 The herb beds had been weeded, and a seedbed prepared for the annual plants and flowers. In other areas of the garden, borders had been top dressed with compost and well-rotted manure so that plants can flourish, allowing the vibrant growth and colourful displays of flowers which give so much pleasure to visitors in the months ahead. 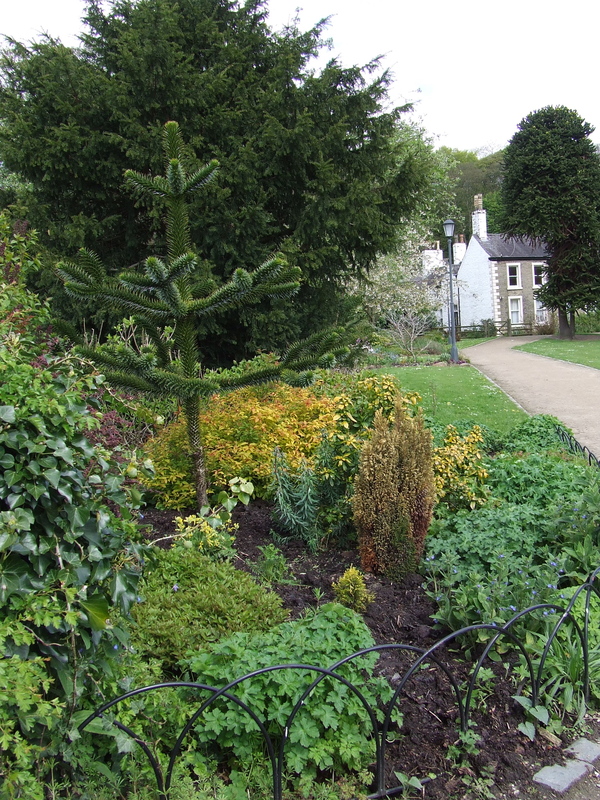 After some TLC from the Friends of Chadkirk volunteer gardening team. These bags , clustered by the gate from the gardens into the lane, are just a temporary feature. Soon, someone from the local authority will pick them up and take the material away for re-cycling. In addition, employees of Solutions SK, will from time to time mow the lawns. Together we create a special place. 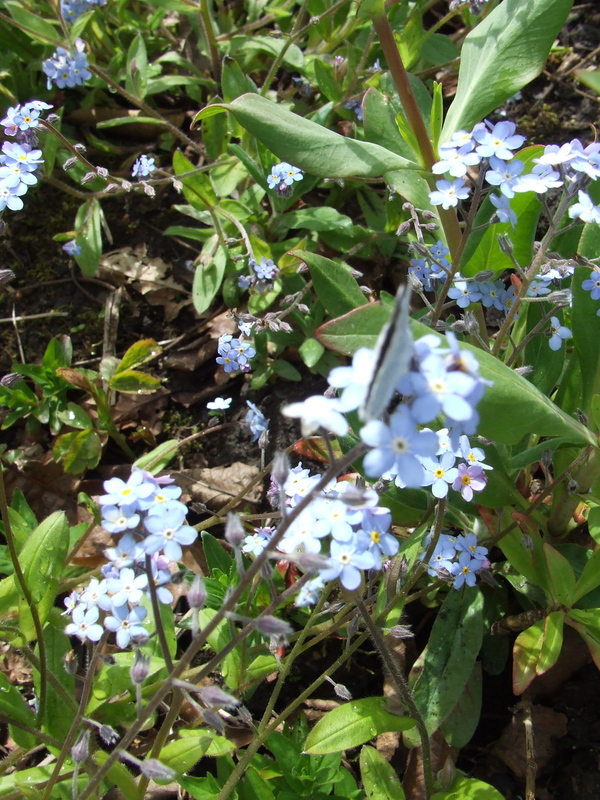 And for those with time to sit and stare, there’s also an opportunity to observe and enjoy some of the biodiversity which Chadkirk supports. 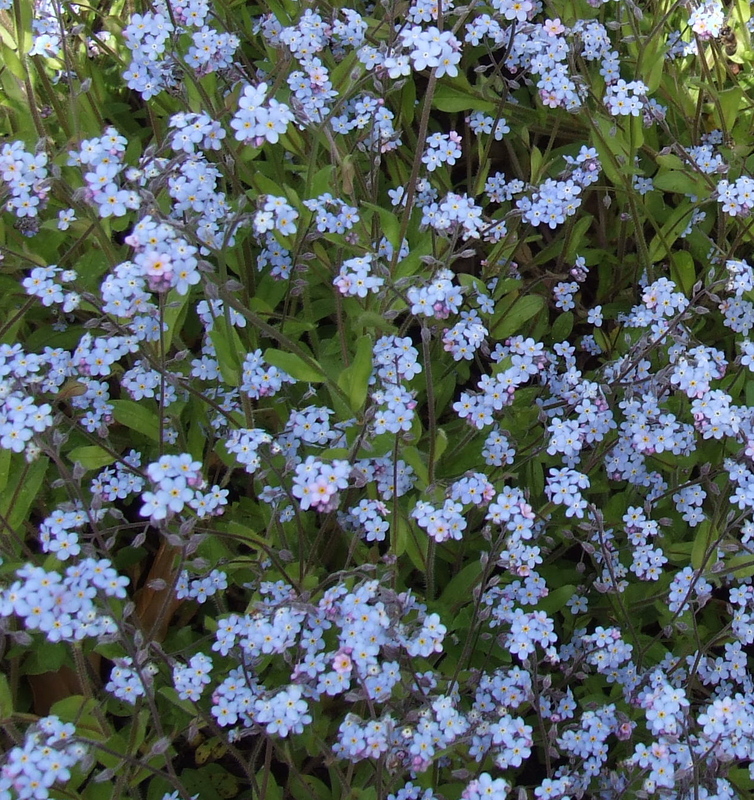 One of the herb beds is frothing with forget-me-not flowers.These nourish and feed butterflies and honey bees. Looking closely when you visit…what will you see?